EcoDrama program. Photo courtesy of New Albany News. Entire contents copyright 2013 by Fearless Designs, Inc. All rights reserved. Next month, StageOne Family Theatre presents two productions in celebration of Black History Month. The first, Jackie and Me by Steven Dietz, tells the story of Jackie Robinson and the breaking of baseball’s color barrier. The second, an adaptation of Mufaro’s Beautiful Daughters, is the result of a developing partnership with the University of Louisville conceived to broaden the University’s connections within our community and contribute nationally to the Theatre for Young Audiences (TYA) scene. Leading that effort for StageOne is Associate Education Director Talleri McRae, who developed her passion for TYA while an undergrad at Northwestern University. McRae arrived in Louisville two years ago with a freshly-minted M.F.A. from the University of Texas at Austin. TM: As a teenager I worked at a children’s theatre in which I had been a participant. It was my first paid job, and I found that I really enjoyed working with the kids. When I started my college career at Northwestern, I wanted something that set me apart from the other theatre students. So instead of doing just theatre, I told people I worked with young people in theatre. It started off as a persona of sorts; and before I knew it, that point of view had become my passion. SD: Like automatic writing, some part of you knew what was really important to you. TM: Something like that. It ended up being the perfect fit. I like young people; I like art; I like talking to young people about art – all the elements merged. SD: One of the productions this season was a musical version of Suzan Zeder’s Wiley and the Hairy Man. It has been a while since StageOne Family Theatre regularly staged new pieces. TM: Yes, historically StageOne Family Theatre has been responsible for adding to the repertory of plays for young audiences. Moses Goldberg, the company’s former producing director, wrote hundreds of new works. The theatre has also commissioned works by playwrights such as Mark Medoff (Children of a Lesser God) and Katherine Paterson (Bridge to Terabithia). It feels like we are in a new breath of StageOne Family Theatre in asking not only, “What are the plays we can bring to Louisville?” but, “What plays can we make for Louisville?” Wiley feels like the first step in reinvigorating that part of the company. SD: I know it takes a lot to bring a new work to stage. What are you working on for next season? TM: We are in the early stages of a new collaboration with Le Petomane Theatre here in Louisville. SD: They are so talented. TM: It is a wildly creative company, and they are working on a piece around the Robin Hood legends. That should be really fun, and we are hoping it will be ready as part of our next season. We are also looking at a piece on young Cassius Clay that is slated for the 2014-15 season. I think that one in particular will have a lot of meaning for the Louisville community. Those are both in the early stages of development, but we feel good about them. We like to reserve at least one spot each season for something new and unique. SD: It sounds as though you are working hard at developing partnerships within the community. I understand the company is also working in a new way with the University of Louisville. TM: One of the things I love about StageOne Family Theatre is that the company is always open to new opportunities. Peter Holloway (our producing artistic director) mentioned that UofL was looking for ways to connect with the city of Louisville in different ways. One of the many projects in discussion was a college-level course on the professional production of theatre for young audiences. When Peter asked if anyone would be interested in teaching such a class, I raised both hands. When I discovered professional theatre for young people as a college student, it opened my mind to so many opportunities I had never considered. I began to realize that you don’t have to be in New York, Chicago or Los Angeles to perform professionally. Some of your most honest, helpful, intelligent audiences are going to be the young ones who tell you the truth. Adults can be really polite. If something is not working for a kid, they are going to let you know. I am really excited about spreading that to other college-age artists who want to work in this field. So I put together an outline for the course based on the conversations we have here in the education department. SD: What would be your main foci? TM: There are three key aspects to that discussion: arts experience, process and instruction. What is the arts experience we want for young people? How do we let them know about the arts process? How do we integrate the underlying concepts of the two into the classroom instruction? That got me thinking about some of the conversations I could have with college students. For instance, we can talk about the qualities and characteristics that make young people a unique audience. What are some ways children are sometimes overlooked by the adult community, and how can we speak to that through art? How can we tell a story so that they all feel like storytellers? SD: This course is designed for education and theatre students. How will this course benefit young educators? TM: I want to think about how the arts can change the way we educate young people. I hope to get them thinking about the potential impact on pedagogy regardless of subject. The arts can inform our class preparation whether we are teaching science, math, social studies or art. We need to unlock a student’s creativity and their own unique point of view so that it can be part of learning for them throughout their lives. SD: You mentioned the education department at StageOne Family Theatre. What is your mandate? TM: We work with educators in 20 to 50 schools throughout the Metro Louisville area during any given school year. We believe that bringing the arts into the classroom can improve teaching and learning techniques. SD: What exactly does that mean? SD: Can you also expand on the advantages of shared experience? TM: I believe theatre can have a transformational effect on the teacher/student or adult/child relationship. Children are constantly in the role of being instructed by adults; theatre provides an opportunity for children and adults to share an experience. Rather than the teacher asking questions that require specific answers, it makes room for a discussion in which young people’s insights are validated. I particularly like it when theatre offers young people and adults an opportunity to laugh together. It is probably funny to them for different reasons, but it is still funny. One of the things I love about Louisville is that we raise patrons of the arts. Through the education programs here at StageOne Family Theatre and the other arts organizations, we have made attending the arts commonplace. At StageOne, we give the youngest audience members an opportunity to support the arts. TM: With our Play-It-Forward program, any student can invest in the experience of another student. If a kindergartner gives a dollar, for instance, we will use that dollar to subsidize another kindergartner who might not otherwise be able to experience live theatre. SD: How would you define the benefits to the community – aside from having a thriving theatre for young audiences? TM: There is ample evidence to support the idea that we must engage young people in the arts before the age of eighteen. Most people who remain unexposed after that age will not seek out the arts on their own. It won’t automatically be part of their lives. I don’t think it’s an accident that great artistic cities also have outstanding programming for young audiences. SD: Speaking of that, are collaborations such as the one you are involved with at the University of Louisville very common? TM: If you look carefully, creative partnerships are out there. One example is Childsplay in Tempe, Arizona. 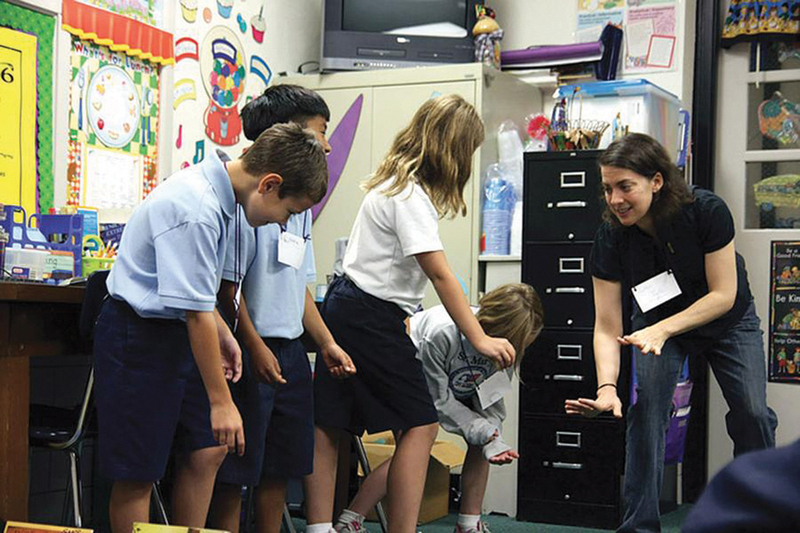 Arizona State University provides several courses about theatre for young audiences on the undergraduate and graduate levels. They have a close relationship with Childsplay, and the students enrolled in the courses at ASU have the opportunity to watch this theory employed by professionals in the theatre. SD: What is your vision for the class work at UofL? TM: It’s important to me that the class has a strong connection to what really goes on at StageOne Family Theatre. Assignments imbedded in the class involve, of course, seeing a production at StageOne Family Theatre – preferably one with a student audience. They will also have the option to watch a StageOne Family Theatre educator work in the classroom with a teacher and students. SD: Do you think these will all be traditional college students? TM: I hope not. In fact, if we have a student who is a classroom teacher, I would like to be able to have them try a new arts-informed lesson and report the results of that experience. I want this class to have a strong practical component, because that is what will help build the relationship between us and UofL. SD: Do you foresee any collaboration on stage? TM: Yes! StageOne is presenting a UofL production, Mufaro’s Beautiful Daughters, in February. That production is currently in the schools, so we are talking not only about the production but also about the critical importance of the support materials and the logistics of meeting the teachers’ needs in terms of scheduling, etc. We are helping them with the things we do every day, and things that are commonplace at the University will be very helpful to us. SD: What kinds of materials are you offering teachers these days? TM: We take a holistic approach to our materials, so we have lessons for multiple disciplines within the classroom (math, science, language arts, social studies), for art teachers and also for use at home. The conversations that begin in the theatre may not necessarily be over by the end of the school day. The keys to a good lesson are “juicy” discussion questions about the play and how elements of the play might represent aspects of their life. For teachers, we put that into language that mirrors the state standard teaching requirements for a particular grade level. It took me several years, but I speak “teacher” pretty well now. I’m working to become fluent in “administrator” so I can understand how the materials will read for a principal or superintendent looking at the lesson plan. This season, we’ve also developed a new tabloid-style piece for students that we hope will be taken home and discussed with their families. SD: Do you find that you are still fighting the image of “children’s theatre” as cute and fun, as opposed to an important aspect of childhood development? SD: So you are providing a way for them to begin the conversation. TM: Young people have a lot to say and are already saying it. I think we need to be smart enough to listen. StageOne Family Theatre and University of Louisville present Priscilla Woods’ adaptation of John Steptoe’s traditional African tale Mufaro’s Beautiful Daughters on February 17 at 2 p.m. On February 23 at 2 and 5 p.m. StageOne offers two public performances of Steven Dietz’s Jackie and Me, the story of time-traveler Joey Stoshack’s 1947 encounter with Jackie Robinson, the man who, with the help of Louisville’s own Pee Wee Reese, broke Major League Baseball’s color barrier. Both productions will be in The Kentucky Center’s Bomhard Theater. Tickets are available at KentuckyCenter.org or through the box office at 502.584.7777. Next"Flashdance, The Musical": Fans of The Movie, Fans of Dance, Will Not Be Disappointed.